What insurance do you provide ? Fully Comprehensive, public and employee liability. What clothing and equipment do you have? How long will CBT take? We start at 8.45am and usually finish between 4 and 5pm. There is a legal minimum 2hr road ride and a very full day of training. How long are your training days ? Usually 9am until between 4pm. Are there any add on extras such as petrol etc? Where do you practice for mod1 and how long do you have it for? All courses are fully insured including public and employee liability, but there is an excess of £250. There is a small voluntary waiver for this. If you are going to be taking your motorcycle licence, we like people to come and do CBT first and then see how much time to book for the remainder of the training. That way you know you want to take it further without spending too much money. It may take a couple of weeks longer but we think its the best way for the customer. If you have never ridden before , you will know you like it, and if you have you will know what you need to go further. If you are a novice you should really consider doing the 2 hr introduction so you can come to CBT safe in the knowledge that you can ride the bike. Please remember you will need Cat P moped or Cat A motorcycle on your UK provisional licence or cat A motorcycle, as a provisional entitlement on the paper part of your full UK car licence to enable you to take CBT. You will then need a motorcycle theory test and CBT in place before you are eligible to take the practical test, but you do not need a theory test to take CBT. Bring them with you for all courses. Everyone wants the best deal they can get, and we are no different to anyone else. However the best deal means the whole package not just the cheapest you can find. There are cheaper schools than us and there are also much more expensive, BUT , we do not operate from the back of a van or the garden shed. We have some of the best facilities for learning to ride that you will find, including a 1000ft practice area, miles of private roads and the whole of module 1 test laid out so it can be practised exactly the same way as the test centre . We have a dedicated classroom, with TV, DVD and video. 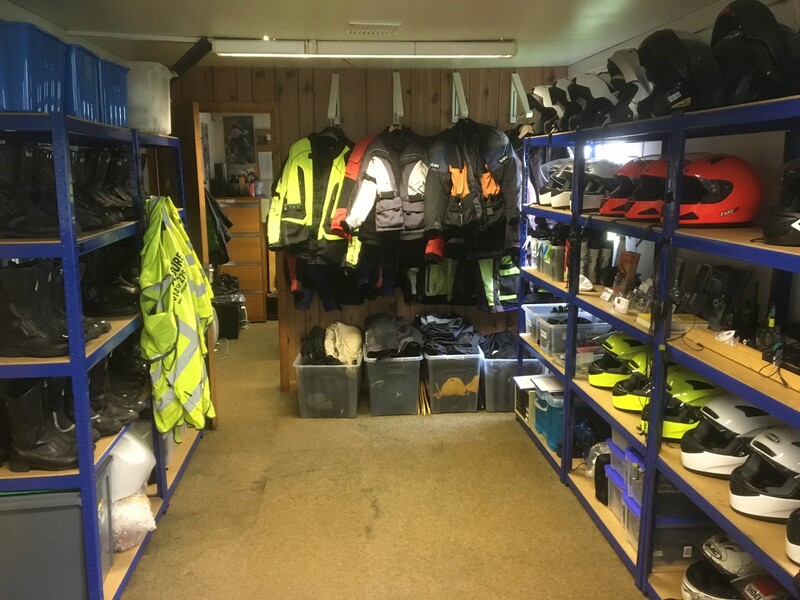 We have 20-30 jackets ,gloves , boots , helmets, armoured trousers, waterproofs and drying facilities. So please understand we do this properly. Not everyone does. Most dont have anything like this to offer you. 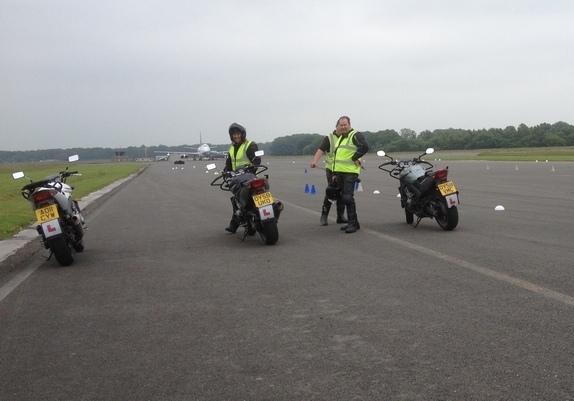 All of our courses will be structured to suit your needs and requirements and we will go to great lengths to make sure you get what you need to be a motorcyclist. Never ridden before ? Perhaps you should try a 2 hr novice introduction. Working on the basics of how to ride the bike. £45 , see the novice intro page. This is a legal requirement before you can ride on the road as a learner and is valid for 2 years from the date on the certificate. It usually consists of a one day course to give you the basic skills to ride on the road. Our CBT areas are in excess of 500ft x 200ft and have ample space for new riders. We also have a full real size crossroads with road markings. You must have a valid UK provisional licence to attend, or a full UK car licence which you must bring with you. If you passed your car test after Feb 1st 2001 you will still need a cbt to ride a scooter on the road , but it will be valid for the length of your licence. If you passed your car test before that date you do not need a cbt to ride a 50cc scooter. The cost is fully inclusive of equipment and machine. You WILL be here all day. Please note you must bring your licence with you. If possible bring the counterpart with you to allow us to see the provisional entitlement. The numbers must match. If you have to come back to complete your CBT there will be a charge of £65 to cover the cost for up to half a day (3.5hrs). This is only to cover our costs. Please note that to progress through all of the categories below you must be tested by DSA. There is no automatic derestriction. Between the ages of 17-19 this is the size bike you are restricted to. You will still have to take module 1 and 2. After 2 years or at 19 you can take the A2 test . . You will have to pass the theory test and the hazard perception test prior to taking the practical test. ALL FEES INCLUDE BIKE , FUEL , INSURANCE AND CLOTHING. 19 years onwards. This test must be taken on a motorcycle of 25-35KW and will allow you to ride up to a maximum of 35kw ( 47bhp ). The bike can be restricted but not by more than 1/2 of its original power ( max 94bhp )so you cannot for example buy an R6 ( which is over 100 bhp ) and restrict it. The advantage of this test means that you can then take your full power licence after 2 years instead of waiting until you are 24. This is the route to unrestricted biking. It consists of training and test on a large bike i.e. a minimum 600cc. ALL FEES INCLUSIVE OF BIKE , FUEL , INSURANCE AND CLOTHING. If you haven''t ridden for a while or need your skills and confidence restored, then why not spend some time with us. You will definitely go away a much improved motorcyclist. We will tailor courses to the individual needs even to work on one aspect of your riding. Structured to help you realise your biking potential, with the understanding of how to plan, anticipate and progress to a high standard. Training is by Senior IAM, ROSPA or Police class one instructors, with IAM or ROSPA tests available ( although it is probably easier to book your own but we can help with arrangements). All courses are individually tailored and are generally One 2 one unless you come with a friend of similar ability. The full day can range from 100-200 miles of riding depending again on what stage your riding is at and what you are working on. This can be to generally improve your skills or as preparation for an Advanced test, it is up to you how far you want to go. Many people use this route because they don't want to join a group or perhaps they want to know exactly who their trainer is and what their qualifications are. Advanced training is £135 per half day ( 4 hrs approx ) and a full day is £220 on a one to one basis. If you did your bike test with us there is a 10% reduction.